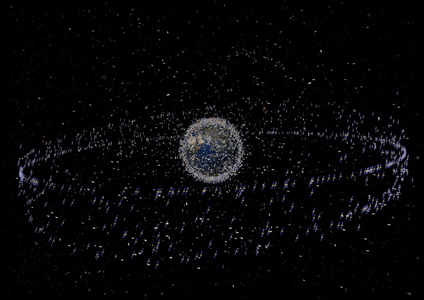 The number of active satellites is steadily increasing and the number of inactive satellites and other debris is increasing at an even faster rate. Since none of the ways of removing existing debris from space has been tried in practice and no projects of removal have been formulated, increasing efficiency of the use of outer space is becoming more and more important. In particular, the geostationary orbit (GEO) gets more crowded. The number of active satellites which used to be around 370 some five years ago has reached 406 (Tim Flohrer, Classification of Geosynchronous Objects, Issue 14 and earlier issues. ESA-ESOC Darmstadt, 2012.) in 2011, an increase by 10%. The total number of systematically observed objects in that orbit was 934 at the end of 2007. It increased by 16% to 1069 at the end of 2011. The population of satellites is subject to significant changes. In the last 5 years, 2007-2011, 141 new payloads and 15 rocket bodies were launched into the GEO 76 objects reached end of their active lifetimes. Not all objects were properly re-orbited. Same were left in or near the orbit, adding thus to the population of debris. Satellites as a rule use radio transmissions for receiving and sending information to ground stations. Thus one or more radio stations have to be on board of each satellite (spacecraft) and, vice versa, each space radio station has to have the services of a spacecraft, such as the maintenance of proper temperature, of supply of energy, etc. Yet, there is a certain dichotomy in registry. Radio stations and transmissions are in the mandate of the International Telecommuncation Union (ITU) (Space Network List, Section A1. See at www.itu.int/ITU-R/space/snl) , while satellites (space objects) are registered in accordance with the Registration Convention by the United Nations. An Online Index is in the mandate of the Office for Outer Space Affairs (www.unoosa.org/oosa/SORegister/index.html). No official provision exists for matching orbital positions of space radio stations, or space networks in the ITU terminology, with orbital positions of satellites. In most cases, a satellite is positioned by station-keeping engines at or near the nominal orbital position of the space radio station. The ITU maintains efficient procedures of coordinating telecommunication operations and services with a view to ensure optimal, fair and rational use of the radio frequency spectrum. In addition, the ITU can determine which nominal orbital position is suitable for the case in hand. These procedures require some time and a suitable solution may not be available in all cases. At present, the ITU tackles over 3000 applications for radio space networks. Of these, one third awaits processing (category A), one third is in the coordinating process (category C), and 1021 have been notified (Category N) in the Master International Frequency Register. That last category of space radio stations, called space networks, enjoy international recognition and protection against harmful Interference and are expected to engage in radio transmissions. Positions of radio space networks are currently published in the Space Network List Online on the ITU website. That list gives the longitude of the orbital nominal position, the abbreviation of the administration, and in the third column the “satellite name”. Strictly speaking, it is not the name of the satellite, but the name of the radio station of the space network. attempts to match space networks of category N with active satellites at the relevant orbital positions. At a typical nominal orbital position is at least one satellite and one or more space networks. It reflects the situation in specific dates in five years from 2008 to 2012. The overall situation does not change much in that time interval but, of course, the appearance of any individual nominal position depends on the fact that almost every two weeks one or other satellite starts or terminates its activities. For a study of a specific nominal position a detailed update is quite necessary. with an introductory text and with a table identifying the satellites. The critical point is in the determination of positions of geostationary satellites. Launching of satellites is in the hands of sovereign states. It requires a sophisticated technology to reach the geostationary orbit at an altitude of some 35700 km above ground and to keep the satellite within narrow limits of longitude and latitude. Station keeping motors have to counteract perturbation forces exerted by the Moon and Sun requiring fuel for the lifetime of the satellite which is today of up to 15 or 18 years. The most extensive source of data of satellite positions are the NORAD Two Line Elements (TLE). The TLE are derived from observations by a global system of observing radars and telescopes, the US Space Surveillance Network. It detects objects of down to 10cm in low orbits and objects down to 1m in the geostationary orbit. Another system is the International Scientific Optical network, ISON, operated by the Russian Academy of Sciences since 2005, claiming a capability to detect objects down to 30 cm in the geostationary orbit. Data from both sources are processed at the ESA-ESOC Institute in Darmstadt, Germany, and results are published in the Classification of Geosynchronous Objects, Issue 13 in 2011. Of great help is the Large Encyclopedia of Satellites and Space Probes, 1957-2012, Library of the Academy of Sciences of the Czech Republic, Dr. Antonín Vítek, at www.lib.cas.cz/space.40. Obligatory regulation has not been used in space law in the past thirty years. Consequently, also the suspension or deletion of unused space networks is fully in the hands of administrations. If applied on a voluntary basis, the overcrowding of the GEO would markedly decrease to the benefit of all users of the GEO..